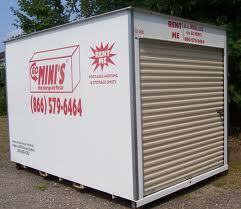 Go Minis is a storage company based in the United States that states it is an affordable alternative to PODS. They offer three different sized containers to their customers and deliver containers straight to the doors of their clients. Customers have as much time as they need to fill the container and after calling Go Minis, a driver will arrive and haul the container away where it will be placed in secure storage. The company has perfected the easy transportation of their units which are 12 feet, 16 feet and 20 feet long. Go Minis invites their customers to view the process themselves from the comfort of their driveway. Each Go Minis container is created using a patented design which ensures that loading and deloading in your driveway is a quick and seamless process. The entire move is handled professionally with the unit delivered to your door soon after you contact the company. The driver will have a contract for you to sign and once this has been completed, the unit is left behind and you have whatever amount of time you specify to load the container as Go Minis do not impose a time limit. Unlike portable storage where the goods are removed from your site, it is possible to keep the unit on your property for the duration of your contract if local government regulations allow it. Otherwise, you can ask the company to pick up the full container and place it in a secure location. The company even provides certain supplies and equipment to help you move including boxes, packing tape and bubble wrap to protect fragile items. The Go Minis service is extremely convenient for businesses of all sizes that are looking to move or store valuable documents or equipment. There is no easier way to move furniture than to place it in a Go Minis container and keep it secure. A Go Minis container is also perfect for keeping records safe as the company will transport them to their central storage area which has excellent security. You can even take advantage of cheap bulk sales of inventory and keep it stored in the containers. All Go Minis containers are 8 feet high and 8 feet wide with the aforementioned trio of lengths also available. The bottom of each container is 8 inches above ground level but is easily accessible via a well designed step. The translucent roof ensures that plenty of light gets in if required. The roll up door is strong and secure but also easy to operate and lock. The floor of each container has been pressure treated and has a sealed surface to ensure that moisture does not affect your goods. The containers are fantastic and the company knows how to transport them easily. Yet state of the art equipment would be nothing without excellent service and Go Minis certainly provides this. Customers have been extremely impressed by the efficiency of the company and the conduct of its employees. If your home is overly cluttered or else you have important items that need to be kept safe, Go Minis is one of the first companies you should look for. Unfortunately, they don’t perform interstate moves but hopefully this will change in future. Be sure to use a Go Mini’s promo code to save 5% off monthly storage costs.